Lazio have been fined 50,000 euros (£38,250) after their match against Napoli on Wednesday was temporarily halted following racist chants. The Rome club will also have to close three sections of the Stadio Olimpico ground for their next two Serie A home games. The match was stopped for three minutes in the second half after some fans aimed racist chants at Napoli defender Kalidou Koulibaly. League leaders Napoli won 2-0. Senegal international Koulibaly, 24, praised referee Massimiliano Irrati for stopping the match. 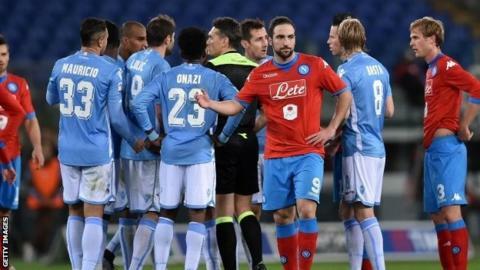 After the match, Lazio manager Stefano Pioli said: "I would not have stopped the match. It was chanting from the minority, but I don't think they were racist. We also have players of colour and they are treated well." The club have frequently been punished in the past for similar offences. A spokesman for Serie A's disciplinary office said the club's North End, Tevere North End and Monte Mario North End must be closed for two matches. This includes a one-match sanction which had been suspended for a year after racist chants from some fans in their home match against Genoa on 10 February 2015.